So you’re working hard to keep body healthy. You’ve learned a lot about organic foods. You see a chiropractor to keep your body aligned and limber. And you may even use acupuncture to keep your body balanced. But what about your home? What are you doing to keep things at home as healthy and balanced as your body? We don’t realize it but our homes are as polluted as the outside air in downtown New York City. Instead of exhaust fumes, your home is filled with toxic chemicals, which include the cleaning products you are using. There are simple alternatives that will help you take the toxins out of your cleaning. You can start with the “basic 4” which includes baking soda, white distilled vinegar, salt and lemon juice. Don’t get confused about what to use or how to mix them. These are all natural products -- it’s a very simple formula. You need to remember that each one has natural properties. For example baking soda is a great smell remover but also is a great lifter. This means if you have something that is difficult to remove – try using baking soda on it. The baking soda helps lift the dirt off, so you can wipe it away. Vinegar is a natural acid. It works great for disinfecting as it can kill 98% of bacteria. Mix the two together and you get a powerful combo that will help clean pots, pans and even the drain in the kitchen sink. There are also great new technologies that are available for cleaning. A new product that is now being sold in the US is a “Skoy” cloth, which is a substitute for paper towels. One of these biodegradable cloths is the equivalent to 15 ROLLS of paper towels. And they can last up to a YEAR. They are an incredible value for anyone that feels they use too many paper towels. If you want to learn more about greening your cleaning you can go to www.greencleaningcoach.com where you can see a video that explains even more about green cleaning. If you would like a recipe and a free video on how to make the cleaner go to www.thejoyofgreencleaning.com. Take a step in the right direction and learn more about removing chemicals from your environment. Together we can change the world, one spray bottle at a time! Leslie Reichert is known as a Green Cleaning Coach. She is a national lecturer, contributor to a The Daily Green, which is a Hearst publication, a frequent homekeeping expert on Martha Stewart Living Radio and author of the book: The Joy Of Green Cleaning- a handbook for DIY cleaners. The Best Eco Baby Gear? Used! The amount of baby gear available these days is astounding, and ranges in price from affordable to crazily exorbitant. There are also a ton of opinions on what, and how much of it, your new baby needs. Wherever you weigh in on this topic, this gear can get pretty pricy, only gets used for a couple of years at the most, and then either ends up in a landfill or occupying valuable real estate in your garage. Luckily, there are many places to find gently used or even new gear and clothes at a fraction of the cost, as well as sell your own babe’s outgrown treasures, and maybe make a little cash for the next go round! As a green mama on a budget, I strive to teach people that often what we think we can’t live without are actually products that we should never be living with. Chemicals, plastics and toxins in our everyday products are unfortunate obstacles that we need to learn to navigate. Babies explore the world with hands feet and mouths. It is essential that what they are touching has been cleaned with toxic free products so they are not ingesting it through their skin and lungs. 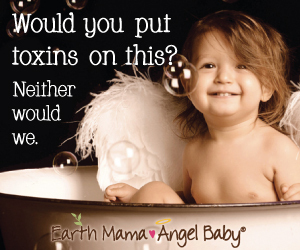 I strongly believe that there should not be a cabinet or drawer in your home containing products so toxic, that if your child got into them, you would have to call 911! If it isn’t ok to get into, why would you spread it around your home? We're happy to have a new guest blogger, Green Cleaning Coach Leslie Reichert. Hailed as the "Martha Stewart Of Green Cleaning", Leslie is a cleaning expert that uses her sparkling personality, great sense of humor and contagious passion to engage her fans and followers. She has learned the hard way what toxic chemicals can do to your body. After years of owning and running a large residential housekeeping service - her body rebelled. She found that her immune system was “broken” and the only way to heal it was to find alternatives to the commercial cleaners she was using every day. Leslie's search for alternatives lead her to her family’s history and launched her into her life’s mission. Indoor air quality has become a new concern for the new millennium. No one in the late 1950’s or earlier ever thought about their indoor air quality. I personally remember going to sleep under a casement window that did not have a storm window on it. During snow storms, I’d watch snow seep into my bedroom and sparkle in the moonlight. This would never be acceptable today with the high cost of energy. People have worked very hard to make their homes air tight. In making homes energy efficient, another problem has been created – poor air quality. The EPA and other experts say that our indoor air is 100 times more polluted that our outdoor air! Some of our homes only see fresh air in the early months of spring before the air is thick with pollen and in the late fall before it gets cold enough to turn on the heat. The other ten months of the year the home has the windows closed and the air is being recycled over and over. If your heat and air conditioning are running for ten months of the year, then you are living with recycled air. Everything you are putting into the air is staying in the air and being re-circulated around the house. Our homes are so energy efficient there may not be any fresh air introduced to our homes except for the occasional open door. You need to know the different ways to keep your air safe and healthy for your family. Here are three tips that are easy and economical. Use non-toxic cleaners when cleaning your house. Do your research and learn what is in the cleaners you are using now and switch to a non-toxic version. The best way to know what is in your cleaner is to make them yourself. You can get a free recipe for a green cleaning scrub at www.thejoyofgreencleaning.com along with a video to learn how to use it. Avoid air fresheners that use chemicals to mask scents. Air fresheners that use synthetic fragrances are just adding chemicals to your air to cover up unsightly smells. Work on finding the source of the smells instead of covering them up. Keep your window screen clean and free from pollen and dust. A simple way to cleaning them is to wipe them with a large looped microfiber cloth. Or you can use a lint roller to collect the dust.